One of Lola's favorite things has been her playmat. It has been great with keeping her entertained for long periods of time (in baby terms) and it also seems to teach her to play on her own. You know....developing that independence so she can be a strong woman one day. Well, as you know, Lo is a big girl. Over the past couple weeks she's been having a hard time with the playmat that we love so dearly as her body basically takes over the entire thing. When she would try to turn over onto her belly, her legs would get stuck on parts of it and the toys hanging down from the top would be in her face, etc....it's been pretty pitiful. Plus, she would get real frustrated that she couldn't move on it...the girl is ready to get to crawling. But, no fear, I've found something new and improved. It's time to throw out the old playmat (or actually put it away until child #2 rolls around) and bring in the new mat made for big girls. This is one of my best finds yet!!! Must Have #8 . 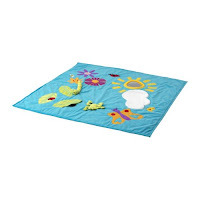 Check out this ADORABLE playmat that I found at Ikea (http://www.ikea.com/) for next to nothing. Seriously, it doesn't get much cuter than this. This is like the Taj Mahal of playmats. Lola LOVES it!!! When we first put her on it, it was like she had died and gone to heaven. She was fascinated by all the little things that surrounded her. She is able to pull and tug and grab and push all the little motifs on the mat. It also makes sounds and has different textures that help stimulate the senses which is great for baby development, motor skills and helps develop their desire to explore. Plus, due to the "antislip material" Lola is able to move all around now....get some good traction and go. We've had this mat for less than a week and she is already rolling from one side to the other, turning, getting up on her arms and knees better and more. Seriously, this girl is ready to rock the crawl. I have a feeling it could be any week now so we're ready to get geared up and start child proofing (BTW...we have no clue where to begin with the childproofing thing so I'm sure this will be quite an experience...it's all about trial and error...right?). Oh, and I must add one last great thing about this mat....at the end of the night, you can fold it up and put it away. As many of you know I don't like baby "stuff" laying around everywhere. I especially don't want it all over my "adult" living room. So I love things that I can put away at the end of the night. This is just that....LOVE IT!!! Here's a great quote I heard the other day that for some reason made me giggle. I'm not sure why b/c it is sooooo goofy but it did so I thought I would share. Yep, started giggling again when I typed it out....he,he,he.